Obituary for Mary Babitz | Langeland Family Funeral Homes, Inc. Passed away Thursday morning, March 1, 2018. Mary was born August 7, 1923 in Kalamazoo the daughter of Harold and Helen (Luce) Herron. Prior to her retirement she worked for many years at Upjohn Nursing Home, now Heritage, in the food service department. 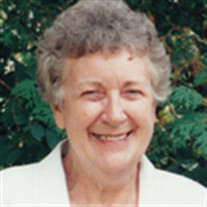 She enjoyed gardening, camping, traveling; and in her younger years enjoyed playing volleyball. She especially enjoyed spending time with her family and friends. On November 24, 1945 she was united in marriage to her loving husband Harry Babitz, who preceded her in death on December 30, 2000. Mary was also preceded in death by brothers and sisters, Leslie Herron, Dorothy Narlock, Virginia Reenders, and Harold Herron, Jr. She is survived by her sons, Ralph (Carol) Babitz, Ronald (Roni) Babitz; 2 grandchildren, Stephen Babitz, Haley (Jason) Kamp; and several nieces and nephews. The family wishes to thank the staff of Heritage Community for their loving care. Friends may meet the family from 10:00-11:00am Wednesday, March 7 at the Langeland Family Funeral Homes, Memorial Chapel, 622 S. Burdick where services will follow at 11:00am. Private interment will be in Robinson Cemetery. Memorials may be directed to Arthritis Association or Heritage Community.